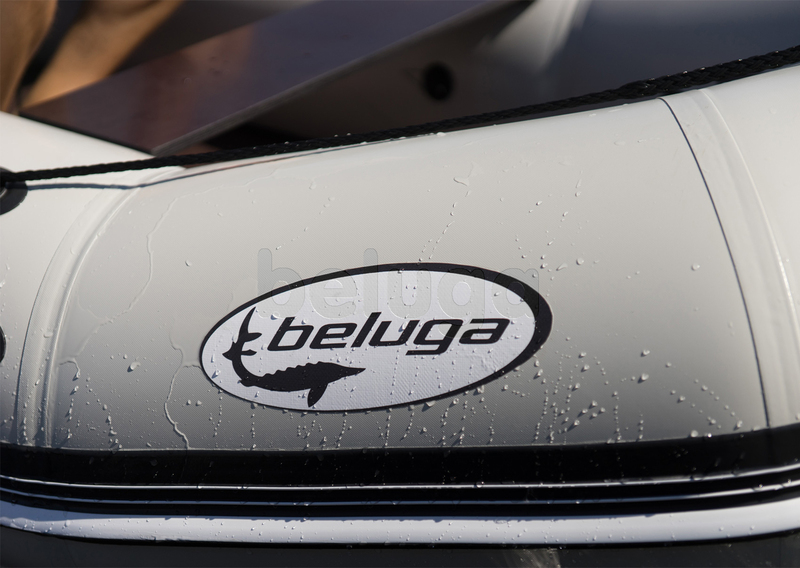 Beluga online store proposes C series motor boats. 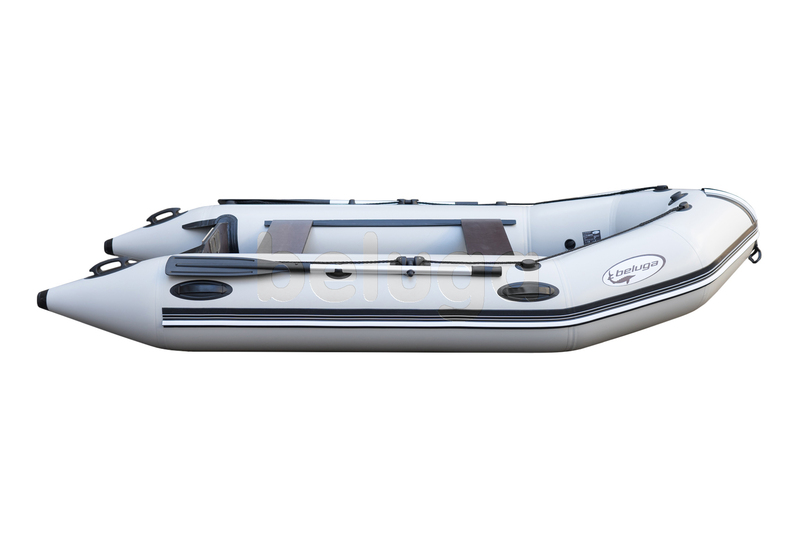 This category contains the biggest flat-bottomed models of 10’-12’ length and 1’5” tubes diameter. 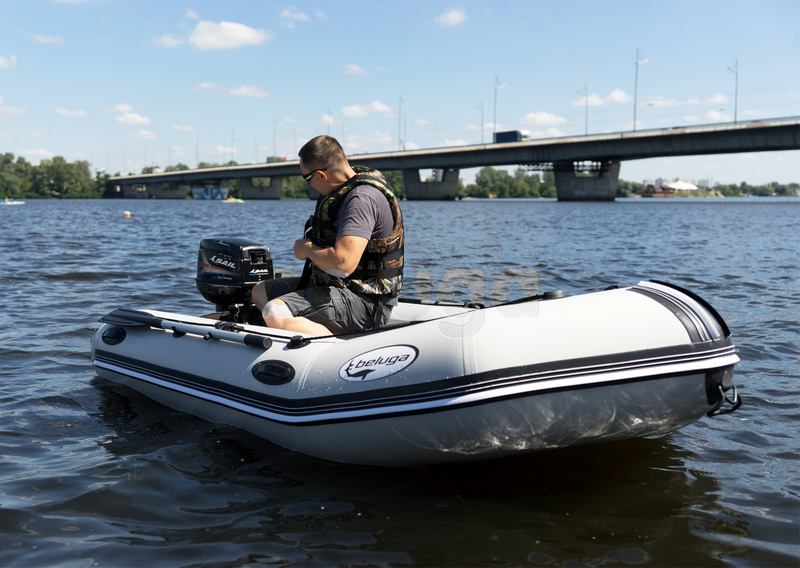 These boats are characterized with high level stability and specially designed raised shape which provides high speed and good maneuverability. Here is the overview of the whole category and of the Beluga C class model presented on this page. 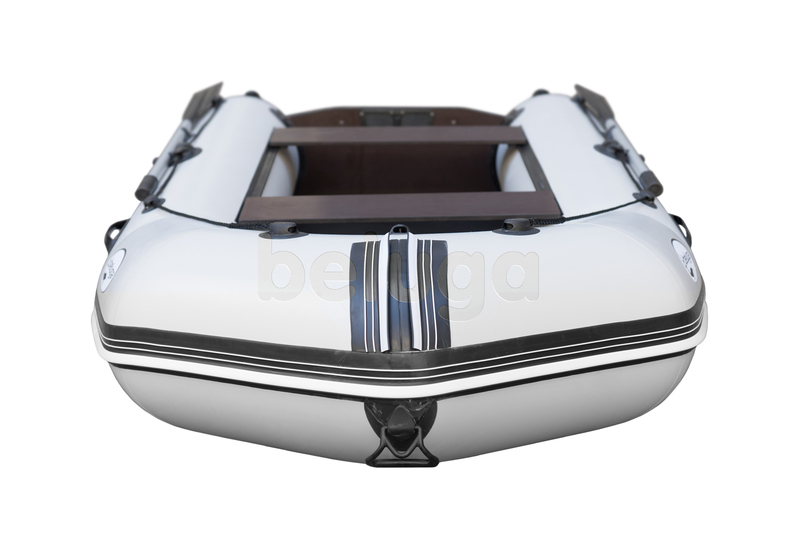 The technical features of Beluga 11 ft. Light Gray Inflatable Boat (10’10” length and 5’2” width) provides the ability of carrying up to four persons of total 360 kg weight. 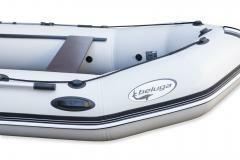 The model is provided with all important equipment and accessories which characterizes Beluga C class inflatable boats. The strong five-layer reinforced material with the density of 950 g/m2 is the guarantee of durability and protection from the damage. Light gray color of Beluga 11 ft. Inflatable Boat will highlight it against the background of others. This C class boat perfectly suits for long journeys with the company of friends. It is also the best choice for hunting and fishing at various environmental conditions. 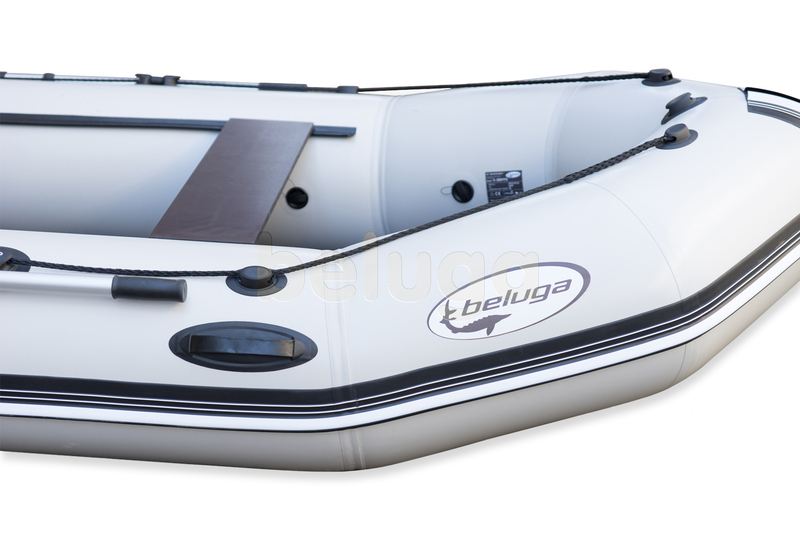 Beluga 11 ft. Light Gray Inflatable Boat provides safety, comfortable and effective use. 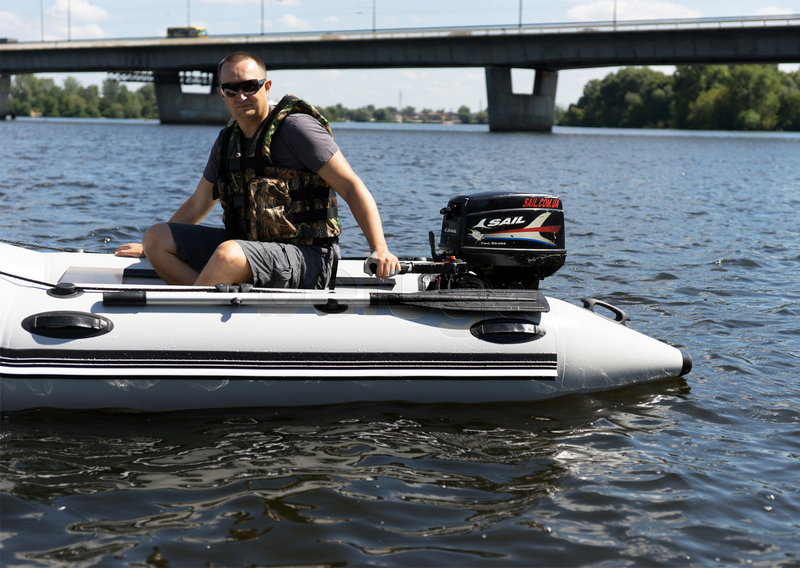 These features together with suitable price are the conclusive evidence for choosing this model among the greatest variety of other proposition at modern market of inflatable boats. 3'7" x 2' x 1'4"
2'11" x 2' x 1'4"
2'7" x 2' x 2"
Seats regulated system which provides various install positions for personal height of users. Strong durability because of the 950 g/m2 and 1080 g/m2 density of the main and additional materials. 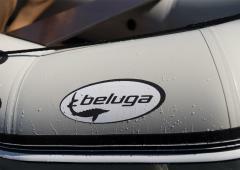 Beluga C series boats are equipped with FFD type of decks. 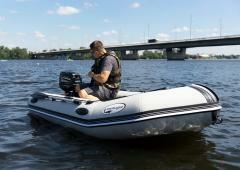 The maximum power of outboard engine is 5 hp. Each C class inflatable flat-bottomed boat is packed into hermetic bag and backpack. The last one is made of the same material as the boat. All models are completed with a set of accessories. 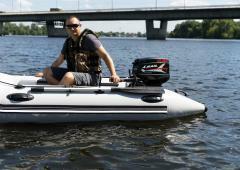 It includes pair of paddles, attachable seats, powerful pump and repair kit. Black under seat locker. Compact and suitable locker is used for keeping fishing equipment and personal things. The locker looks like a bag. It is located under the seat and fastened to it with the straps and velcro. Moreover; it fastens with a zipper, and is equipped with additional exterior pockets for small items. Special handles are provided to carry the locker in hands. The other important advantages of this accessory are durable water-proof material, convenience, practicality and efficiency in use. Black Soft pad. When you are going on a long trip, hunting or fishing it is important to take care not only about security but also about comfort. The specially designed pad will help you to avoid discomfort during the journey or fishing. This accessory is put on over usual wooden seat to make it more comfortable. The pad is made of waterproof nylon fabric, which is filled in with a foam rubber. So, it is quite easy to clean, and suitable for body position. The pad is fastened on a sturdy zipper and is adjusted by three straps on the bottom. It can be easily attached and removed when it is necessary to be changed. It is very simple to wash. The comfortable boat for washing. Dust is imperceptible on it. When the time of washing comes, dust and other dirt are easily washed thanks to boat material. It is very practical and convenient. I read previous reviews. I want to add from myself, that this boat also excellent assistant in hunting. Recently I could float away in a hard-to-reach spot on the swamp, where I found many ducks. It was a very good hunting, and this boat was good in transportation of everything, what I hit. Light gray - my favourite color. Therefore I very like this boat. Also it has excellent functionality and ease in management that makes it the irreplaceable assistant in an open reservoir or on the lake, even far from the coast. But within 10 miles. I am a fisherwoman. I very like catching fish, and I consider it is my calling. For achievement of my purposes I need the excellent and answering to my inquiries equipment. This boat completely such, what I imagined. Comfortable, practical. Fishing and floating on oars are its main advantage. Do you still doubt to buy this boat or not? The excellent boat for fishing. Also I tried to install on it the motor. Perfectly floats, good controllability. These guys know that they do.